If there’s one company that could insidiously insert itself into every facet of American life, it’s Amazon. It’s already deeply embedded into how many of us purchase things, and therefore has a pretty robust psychographic profile of your taste. Thanks to Amazon Web Services, it undergirds a significant portion of the internet (including the website you’re reading this on right now). It’s aggressive in its dealings with competitors, unafraid to wield its power when dealing with municipalities, and has a checkered history of relations with its employees at its fulfillment centers as well as with its white-collar office drones. But take a look at the results from the Georgetown’s 2018 American Institutional Confidence Poll, released last week. It found stark differences in Democrats’ and Republicans’ respective trusts in the executive branch, religious institutions, and local police. The one institution that both sides loved? Amazon. Democrats ranked it at the top of the list, higher than any other major institution in the poll — higher, even, than colleges and universities. 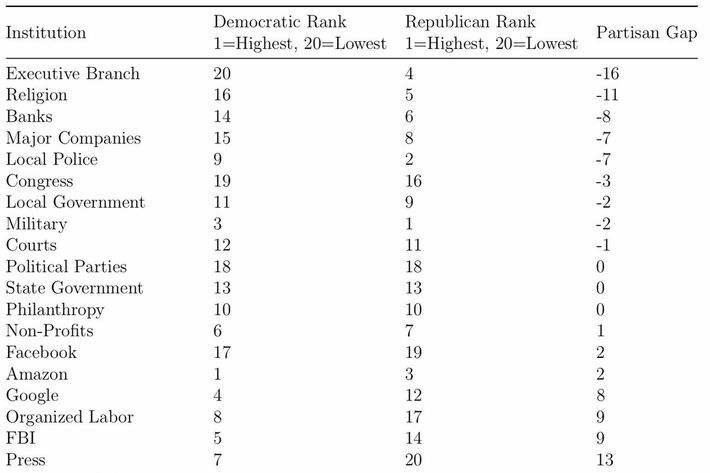 Republicans ranked it third, with only the military and local police winning more institutional trust. From a certain perspective, this shouldn’t be surprising; even as large tech companies have come under more scrutiny, they’ve largely remained popular. But the poll finds somewhat stark contrasts in the levels of trust for some other major companies along partisan lines: overall, Democrats expressed trust in Google, for example, while Republicans very much did not. In other ways, Amazon is a strange institution for both sides of the political spectrum to avow so much trust in. 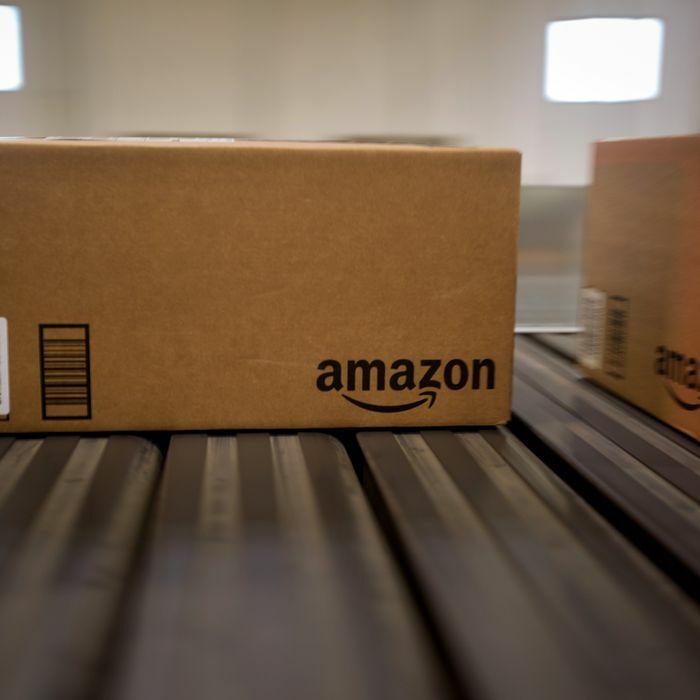 Donald Trump has publicly attacked the company for overwhelming the USPS and for not paying its fair share of taxes (though his attacks on Amazon seem more to do with his personal animus with the Washington Post and Jeff Bezos). Bernie Sanders, meanwhile, was able to successfully shame Amazon into paying its fulfillment workers more through legislation aimed directly at Amazon and Jeff Bezos. It’s likely that some of the goodwill Amazon benefits from comes down to simple utility. While Americans are increasingly wary of tech companies that control information — Facebook is ranked lowest for institutional trust among both Democrats and Republicans — Amazon is still largely seen as the company that gets the box with the friendly grinning logo to your doorstep day in, day out. Even if you factor in that Amazon actually does gather quite a bit of information about you (hi, Alexa! ), a recent survey by Reticle Research and the Verge found that, when compared to Apple, Facebook, Google, Microsoft, and Twitter, Amazon is by far the most well-liked tech company: the one most trusted to keep users’ information safe, and the company users were most likely to recommend to their friends and family. So where does this overwhelming goodwill come from? You could point down to Amazon’s business strategy, which has seen the company burn its endless cash reserves to improve services and expand what it can do. Apple is content to sit on mountains of cash. Google spends its revenue on moon shots and self-driving cars, projects whose payoffs may be decades away. Facebook acquires companies and pays TV advertising rates to apologize for leaking your data. Amazon, meanwhile, pours its profits back into offering a video streaming service for Prime members that roughly rivals Netflix, building out a fresh grocery delivery service, and attempting to solve the problem of shopping for clothes online with Prime Wardrobe. It also isn’t above using smart marketing tricks. That smiling logo on their packages doesn’t just let you know you have a delivery from Amazon — it lets all your neighbors know, too. After acquiring Whole Foods last year, one of the first things Amazon did was to lower the price of avocados and other trendy food items. And unlike nearly every other tech behemoth out there, it’s managed to do all this without suffering a major privacy or data scandal. But we should also keep in mind what the Georgetown survey was attempting to measure: not warmth of feeling, but trust. And Amazon has become so deeply embedded in many Americans’ lives — and with so little apparent downside — that it may not ultimately be surprising that it’s trusted by so many on both sides of the political spectrum. I like higher education and nonprofits quite a bit, but I’m not sure I always trust them to fulfill their mission. When I hit that one-click order button on Amazon, however, I deeply trust that the humidifier for my daughter’s nursery will arrive within two days.